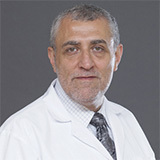 Dr. Hamzeh Tarabichi's educational qualifications are FRCP(C) Fellow of the Royal College of Physicians, Canada, Anatomic Pathology, 1992; FRCP(C), Fellow of the Royal College of Physicians, Canada, General Pathology, 1993; Diplomate, American Board of Pathology, Anatomic and clinical Pathology, 1993; Diplomate American Board of Pathology, Hematology, 1998; Fellow of the College of American Pathologists, MD Unirehmos University, Santo Domingo. Dr. Hamzeh’s work experience spans 26 years as an Anatomic and Clinical Pathologist, Edmundston Regional Hospital, Edmundston, New Brunswick, Canada, August 1992 - November, 1993. Full time Anatomic and Clinical Pathologist, December 1993 - May 1996, Locum during the periods from at the Moncton Hospital, Moncton, New Brunswick, Canada. 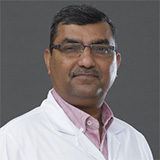 He also has experience as a Consultant Hematopathologist in King Khalid University hospital, Riyadh, Saudi Arabia. May 1996 - May 1997, Consultant Pathologist, King Fahad National Guard Hospital, Riyadh, Saudi Arabia, July 1997, January 2000 and Consultant Pathologist, Security Forces Hospital, Riyadh, Saudi Arabia, January 2000, July 2005. Later as a Consultant Anatomic and Clinical Pathologist and Medical Director of Clinical Chemistry, Zayid Military Hospital, July 2005, September 2009, Head of histopathology and Laboratory Medicine, Medcare Hospital, September 2009, April 2013 and as a Clinical Pathologist & Head of Pathology in one of the prominent hospitals in Dubai since December 8, 2013. Area of expertise are Hematopathology, including extensive experience in interpretation of lymph node pathology, blood films, bone marrow aspirates and trephine biopsies, based on which was declared eligible to write "The American Board of Pathology Examination in Hematology".